I was so fortunate to find Bed and Bike. They are literally full service and help you with every aspect of your trip. We came in for a birthday and they we’re nice enough to put us in an unoccupied room making our stay very comfortable for our group. They have hot water, A/C, etc. They set up shuttle services for us to and from the airport. You can rent cars via the hostel/hotel and snorkeling gear for the day as well! They were amazing communicating back and forth and even more kind in person! Loved my stay here. Great place. Perfectly located between Cabana beach and the town. Very vibrant cozy vibe. Would stay here again. The only reason this ISN’T a 5-star hotel is because it has shared bathrooms. 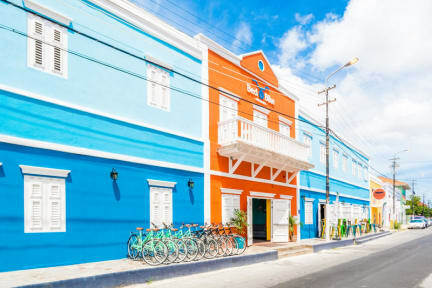 I seriously cannot express how much I enjoyed staying at Bed & Bike Curaçao. The room was incredibly clean and the bathrooms were just as amazing! The entire place was clean, and the staff was ridiculously helpful. Any questions I had, they had the answer. Also, who doesn’t love free bike rentals during your stay?! Beats public transportation. Another note is the restaurant attached, Uno. HIGHLY suggest the pair. Very nice and welcome place. Almost in a city centre, not far from bus stop (right on the corner) and bus station, fruit market, supermarket and food market. Many bathrooms. Clean ones. Very nice personel. 2 kitchens, veranda, huge frige. And cafe if u lazy to cook. Amazing hostel. Location was perfect - close to absolutely everything. Rooms & bathrooms were spotless, beds comfy. Wish more hostels were like this one! BEST. HOSTEL. IN. WILLEMSTAD! Rooms are clean with soft beds. Bike and car rentals are available. Close to city centre. Staff is super accommodating and hospitable. Well worth the price. If you plan on going to the far off beaches it would be advisable to rent a car. Bed & Bike offers a clean, quiet and friendly home away from home. It was perfect and the staff (everyone, including reception, cleaning and security) at all hours were very accommodating and super helpful. The location is very convenient, close to beaches, markets, and bus station if you want to venture further or save a walk lol Hope to return soon and many thanks for a beautiful stay. The staff was super helpful, even before I arrived with providing me with information via email. The location is good. It is only a short walk to the bus station that takes you to all of the beaches. They also provide you with a bike. They will set up a taxi for you from the airport for $35. Everyone staying at the hostel was wonderful. They have a big fridge as well as a microwave and blender if you bring your own food. I stayed in the 6 person mixed room. Beds are super comfy! Great location. You can put down a $100 deposit for the bikes & can use them the whole time. 5 minute bike ride to downtown, and 15 min bike ride to mombo beach. The staff is very friendly & helped us with a lot. This is not a party hostel.. people from all ages 22-70 in our room and we didn’t really meet anyone. Wish they had free breakfast. The bathrooms were spacious .. however the showers were cold. All together, it was an okay hostel if you want to relax and sleep. Not much else to do.